No one knows for sure who erected the Kindred Spirit mailbox on Bird Island, an uninhabited island on the west end of Sunset Beach in North Carolina. Yet, visitors have placed their hopes, dreams, and prayers in that mailbox for years. The day before Theresa and Brian Dering were to leave for a vacation in 2007, Theresa discovered a dimple on her breast. She didn’t tell Brian about it right away, but left a letter in the Kindred Spirit mailbox. The dimple turned out to be stage IIb breast cancer, which resulted in a double mastectomy and reconstructive surgery in 2008. The struggle clarified Theresa’s priorities. 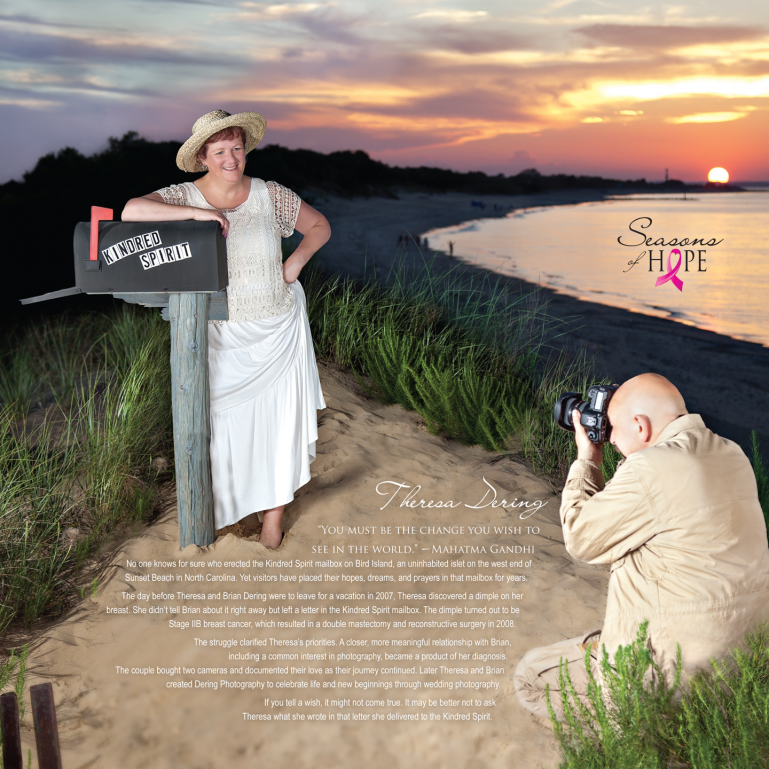 A closer, more meaningful relationship with Brian including a common interest in photography became a product of her diagnosis. The couple bought two cameras and documented their love as their journey continued. Later, Theresa and Brian created Dering Photography to celebrate life and new beginnings through wedding photography. If you tell a wish, it might not come true. It may be better not to ask Theresa what she wrote in that letter she delivered to the Kindred Spirit.